About three years ago, after hearing Dave Ramsey talk about how wonderful Dan Miller’s book 48 Days to the Work You Love is if you are going through a job change or career crisis, I knew I had to read it. Problem was, I’m cheap and busy. I had a lot of books on my “to read” list, and didn’t want to pay full price (price vs. value is another discussion for later this month!). Providence smiled on me one day at a local fire sale store…I found 48 Days for about $4. A perfectly good book recommended by a trusted adviser and outrageously cheap…I bought two! What makes 48 Days so good is that it’s not just another resume and interview tips book. Dan spends the first half of the book forcing you to probe deep within yourself. What are your motivations? What are your dreams? What are your passions? Discover those things and realize that when you love what you do for a living it’s hardly work at all. At Dan’s core is the mantra of finding how your “talents, skills and abilities match your values, dreams and passions”. He dissects the differences between a job, a career and a vocation. And he advocates a balanced approach in living your whole life, not just the time you spend working. The second half of the book addresses the fundamental job hunting techniques…job searches, resumes, interviews, appearance, etc. But there are two distinctions to his approach. First, he’s already led you on a journey of self awareness, so you’re more comfortable and confident. Then he approaches these often mundane job hunting tasks in new and fresh ways. Ways that make you stand out to potential employers. Ways that get you interviews and job offers. 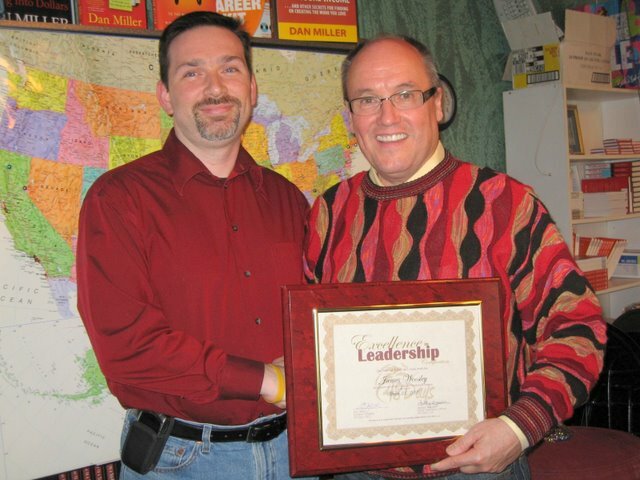 Earlier this year I had the pleasure of meeting Dan and becoming a Certified 48 Days Facilitator. He is as real and as genuine as my father and has no pretense of celebrity. His family is just as real and only enhances my image of him. He’s coached me and answered my questions many times since, and I’m honored to call him a friend. 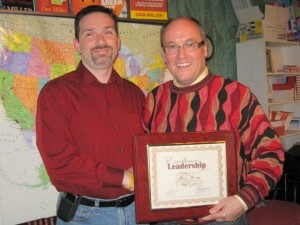 Dan Miller presenting my 48 Days certificate at his home office (The Sanctuary) in Franklin, TN. If you want to learn how to find the work that you love, or perhaps even start your own business, I cannot recommend anyone without first recommending Dan Miller. Read 48 Days to the Work You Love. Then read his follow-up text on self-employement, No More Mondays. Visit 48Days.com to signup for his newsletter and listen to his podcast. If you invest just a little time reading and listening to Dan and following his advice, your perspective on work and life will be forever changed! Have you read the book or had any experience with Dan Miller? Post a comment and let me know what you think! Want to dig deeper than the book? The 48 Days Workshops are the best way move into work you love! Classes will start in December 2009. Email me or sign up for the newsletter to be among the first to know all the details! I’m Going to Save the World! My kids are great at teaching me lessons that they don’t even know yet. For example, my son Ian is on a superhero kick. Everything is about good guys and bad guys. He takes off his shirt to show off his muscles and “flys” around the house saying he’s going to save the world. 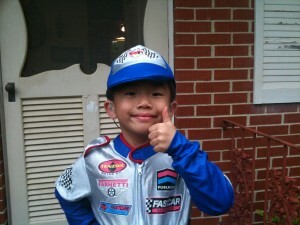 Ian cheesing the camera in his Halloween costume (as a racecar driver instead of super hero this time!). I pat him on the head and being pragmatic, tell him he needs to start one person at a time and see how it goes from there. He doesn’t hear me anyway, and I’m honestly happy that he doesn’t in this case. Who am I to stunt the growth of his ambition? But there is a serious lesson there for us grown ups. We can have the biggest dreams and ambitions, but if we spend all of our time thinking of how to “do it all” or “do it right”, we rarely get started in the first place. I do the same thing all the time. I want to be one of the most successful coaches in the country, with books and radio/tv shows and people lining up for an hour of my time. But I can’t start there. I can’t save the world until I’ve helped one person, then two, then three and so on. Eventually, maybe I can impact the whole world. It’s good to dream! But a dream without action is never going to come true. In order to help myself help others, I’m declaring November as Jobs and Careers month on my blog. I’ll be posting articles related to job searches, resources, self-employment and other topics within the theme all month long. I may even have a special announcement somewhere in there. Plans for December are all I’m going to say today. So what are you going to do today to impact someone’s life? Be that kind of hero!